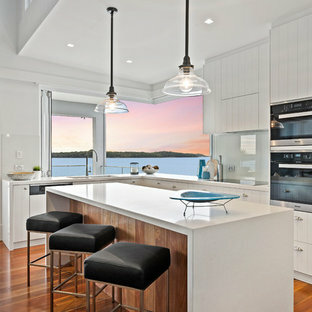 Photo of a contemporary l-shaped open plan kitchen in Central Coast with quartz benchtops, a drop-in sink, flat-panel cabinets, white cabinets, glass sheet splashback, black appliances, medium hardwood floors and an island. 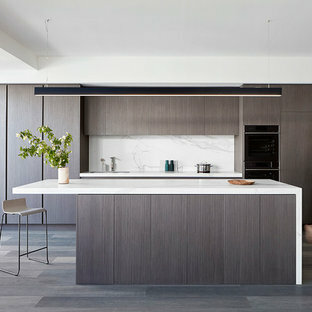 Inspiration for a large contemporary u-shaped eat-in kitchen in Melbourne with an undermount sink, white cabinets, marble benchtops, window splashback, dark hardwood floors, an island, brown floor, white benchtop, recessed-panel cabinets and stainless steel appliances. 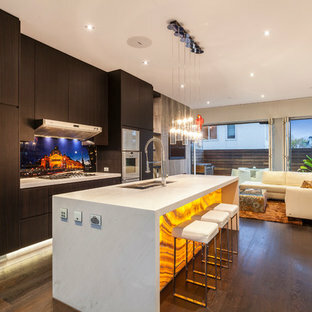 Photo of a transitional l-shaped eat-in kitchen in Melbourne with recessed-panel cabinets, blue cabinets, wood benchtops, orange splashback, subway tile splashback, painted wood floors, no island and white floor. 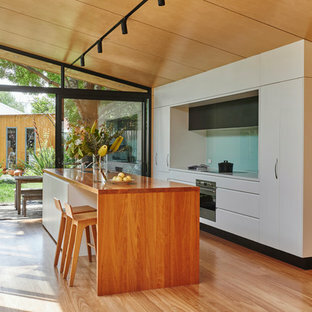 Photo of a contemporary galley kitchen in Melbourne with a double-bowl sink, flat-panel cabinets, white cabinets, wood benchtops, blue splashback, glass sheet splashback, panelled appliances, medium hardwood floors, an island and brown floor. 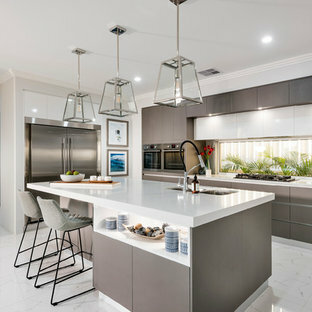 This is an example of a large contemporary galley open plan kitchen in Perth with an undermount sink, flat-panel cabinets, dark wood cabinets, quartz benchtops, stainless steel appliances, porcelain floors, an island, white floor and window splashback. 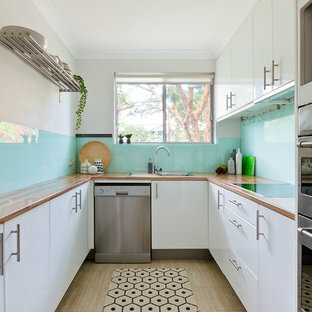 Small contemporary u-shaped separate kitchen in Sydney with white cabinets, wood benchtops, blue splashback, glass sheet splashback, stainless steel appliances, laminate floors, beige floor and flat-panel cabinets. 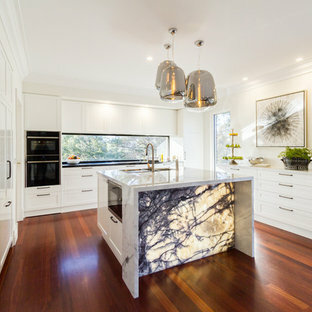 Small contemporary single-wall open plan kitchen in Melbourne with flat-panel cabinets, dark wood cabinets, white splashback, stone slab splashback, dark hardwood floors, an island and brown floor. 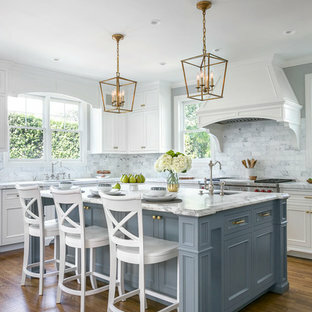 This is an example of a traditional l-shaped kitchen in San Francisco with an undermount sink, recessed-panel cabinets, grey cabinets, white splashback, marble splashback, stainless steel appliances, dark hardwood floors, an island and brown floor. Sloane Square No.92 External Wall Cabinet. Archway House No.106 External Base Cabinets. Leadenhall No.118 Larder Exterior. Kitchen by Smallbone of Devizes. Smallbone’s Beaconsfield showroom. 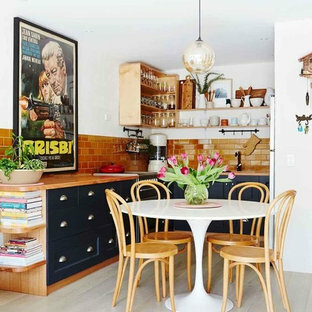 This is an example of a mid-sized scandinavian u-shaped open plan kitchen in Los Angeles with a farmhouse sink, recessed-panel cabinets, white cabinets, white splashback, subway tile splashback, stainless steel appliances, porcelain floors, a peninsula and wood benchtops. Design ideas for a traditional kitchen in Chicago with subway tile splashback, a farmhouse sink and stainless steel appliances.